This was just the right portion for my lunch, next time I would use less oil. If you make these chips at 350 °F/ 180 °C you have to follow the process very closely. The moment between just right and dry not to say burnt is very short. 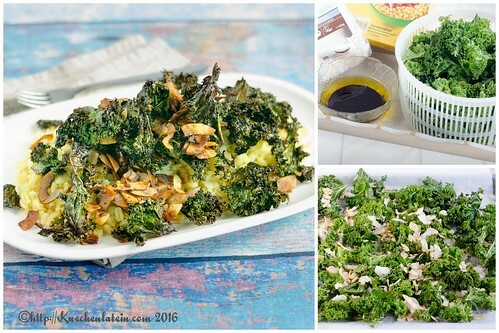 Curly Kale Chips used as a base for a healthy salad. 2 tablespoons shoyu, tamari, or soy sauce; I used soy sauce. Spread the kale evenly on a baking sheet. Bake for 12 to 18 minutes, until the coconut is deeply golden brown, tossing once or twice along the way. If the kale mixture on the top baking sheet begins to get too browned, move it to the lower rack. Dieser Beitrag wurde am 30. Dezember 2016 von kuechenlatein in Recipes & Posts in English veröffentlicht. Schlagworte: Grünkohl, Heidi Swanson. Kale and coconut is an interesting combination, but reading the ingredients it looks like it will work. I like that it easy enough to make a small portion. I read the recipe very carefully; I want to make it sometime. 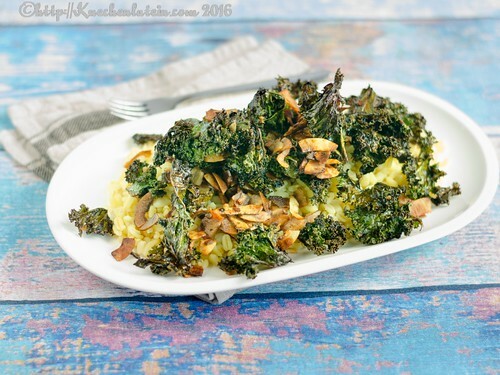 This is an interesting way to use kale to add flavor and texture to a salad. Happy New Year! Yes, this recipe is worth to try. Oh, kale chips…I love them, but they sure are a fussy thing! Looks like yours are cooked perfectly for this recipe. I’ve somehow missed this recipe of hers and am so glad you shared it, so unique and fun!